Warmer weather is coming which means a lot of us will be taking our pooch with us in the car to head out to a park. 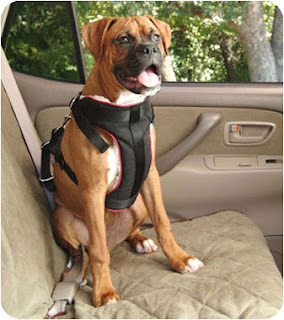 It's extremely important to remember to keep your dog safe with a car seat or other restraint so that in case of an accident, he is always protected. There are a bunch of dog car seats at Bloomingtails, including this harness, which is great for large dogs. It's easy to hook your dog up and it will keep him safe and comfortable on the ride to and from your destination! !